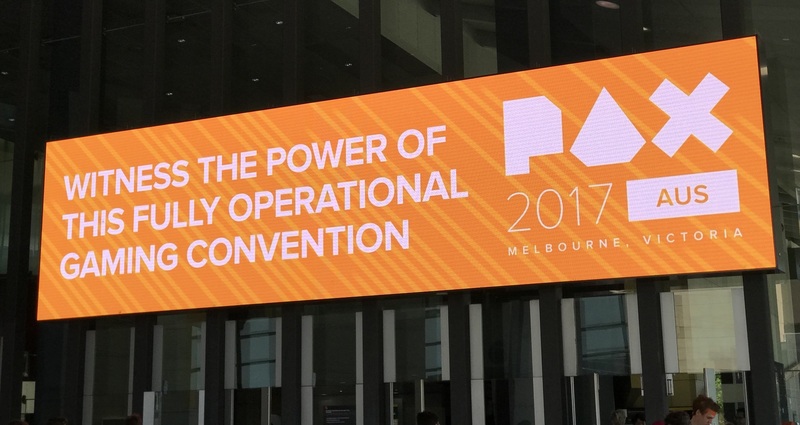 After attending PAX Aus last year, I was keen to go again but pondering if maybe every second year was sensible. Then it was announced that Acquisitons Inc, Penny Arcade’s RPG spin-off, would be making its first trip to Australia which sealed the deal. Just like last year, it was time and money well spent. Don’t be too proud of this technological…actually, do. Because AI was on Friday, and my nephews could only go Saturday, I plumped for a two day pass this time. It was definitely worth it just due to Friday being far less crowded in vendor land. There was plenty of space to try things, even the (still) hot Playstation VR setup (which was impossible to try on Saturday). 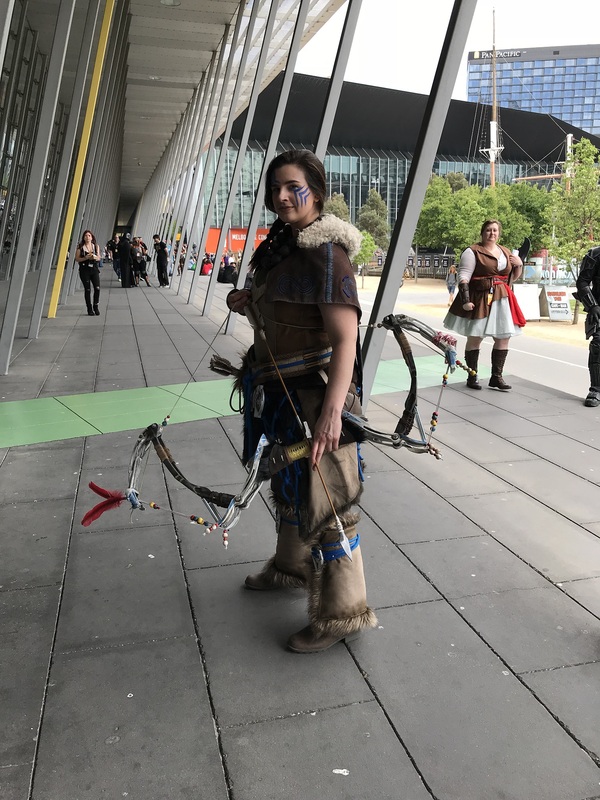 Microsoft had a fully fledged tall ship docked outside on to demo the very promising Sea of Thieves, Square Enix challenged players to run boss fights in FFXIV (complete with running commentary), and best of all was an oasis in the chaos created by two picnic chairs setup for some super relaxing fishing in Far Cry 5 – a minigame within the larger shooter that made buying the full game much more appealing. Last year Overwatch dominated all, but this year it was clear that PlayerUnknown’s Battlegrounds was top dog. It was everywhere, on massive screens with pro players competing in demo world, and being played by the amateurs on the majority of the PC free play machines. I played for a few hours, and came away pretty meh about it. The concept is fun, with the slowly ratcheting tension, but like most combat simulators it comes down to who has the better headshot, and that was definitely not me. There is a lot of hiding and waiting for the map to shrink, which was kind of boring after a while, but the other option – run and gun hunting – means certain death. The graphics and animation are incredibly janky and second rate for such a popular game. I think I’ll give Fortnite’s version a go – it looks a bit more graphically entertaining – and see if there’s more action/less toe-tapping on offer. The AI session was great, despite it not being D&D as I’d hoped. Instead the team ran Star Wars: Edge of the Empire, which turned out to be great fun with an intriguing dice system. Instead of one dice hit/miss rolls, multiple dice are rolled to decide the outcome of the action as well as other things like advantage or special heroic actions. It meant that sometimes an attack would miss completely but the player nevertheless earned some advantage actions, that would allow fun things like reflected laser fire or setting off fire suppressant systems. The success of watching 5 people doing live role play in a massive theatre is very dependent on the players and GM, and lucky for us these guys were all great. Hearing an audience of thousands draw breath as a dice roll went wrong – or cheering when it went right – is pretty entertaining. As is rules-lawyering from the crowd! It was especially impressive to watch Penny-Arcade’s Gabe in the GM role, given he was suffering from a major anxiety attack at the time. Much appreciated that he not only hung in there but GM’d with aplomb (and it was super nice seeing Tycho, his long term sparring partner, subtly supporting him during the game). 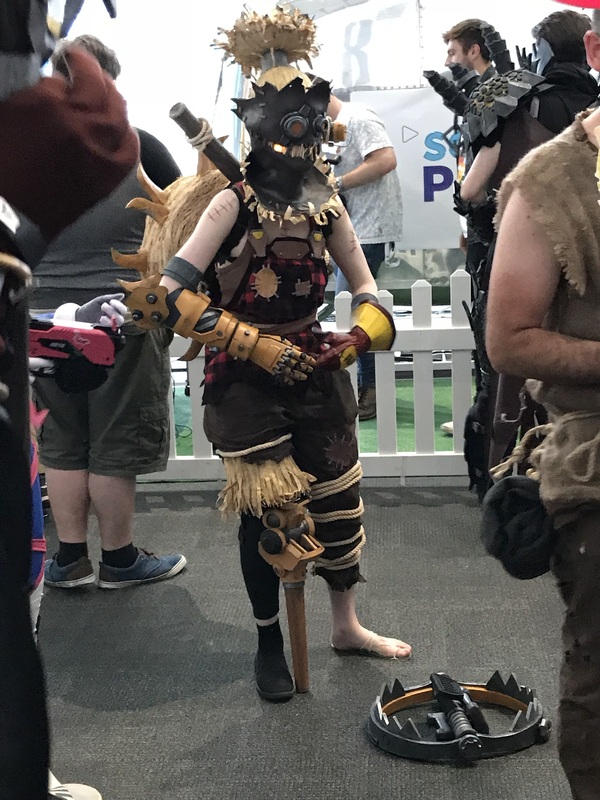 As with last year, the cosplay was amazing, the tabletop section a highlight, and the enthusiasm and acceptance of the crowd was inspiring. 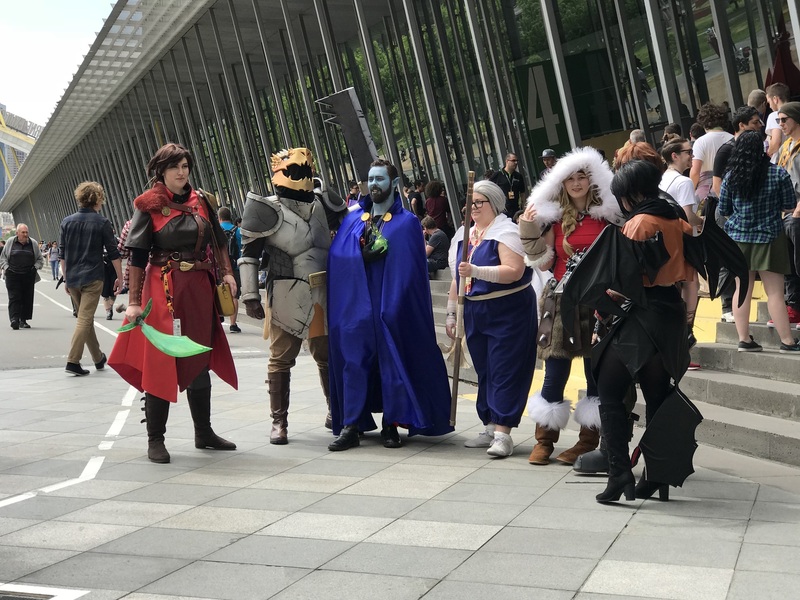 The sign out front says ‘Welcome Home’, and that seems a perfect description of PAX – it’s a home for the people who want to dress up as elves, wear man-skirts, paint miniatures for hours, argue about the intricacies of role playing systems, and play all of the games. 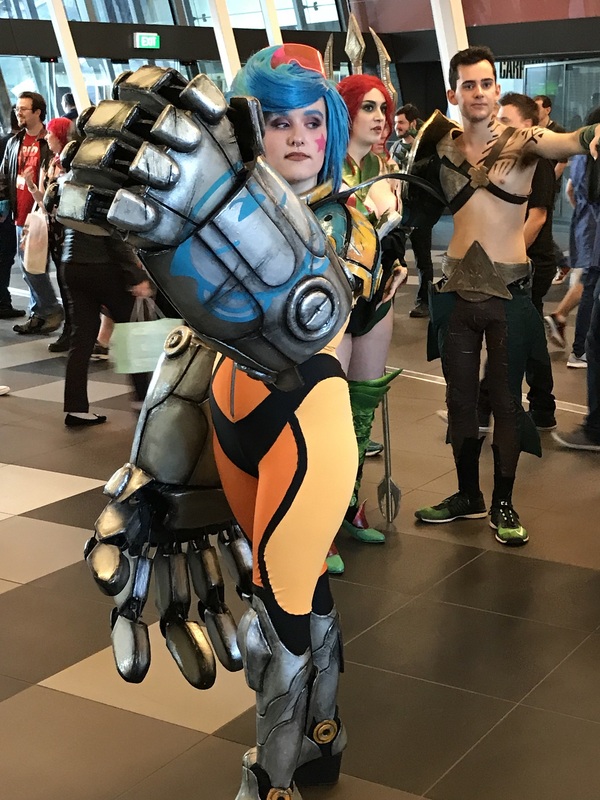 On the weekend I travelled down to Penny-Arcade’s fourth annual Penny Arcade Expo in Melbourne – I figured it was kind of a Blizzcon-lite with far less travel. It’s a three day event, and I went for the Saturday session with two of my nephews. 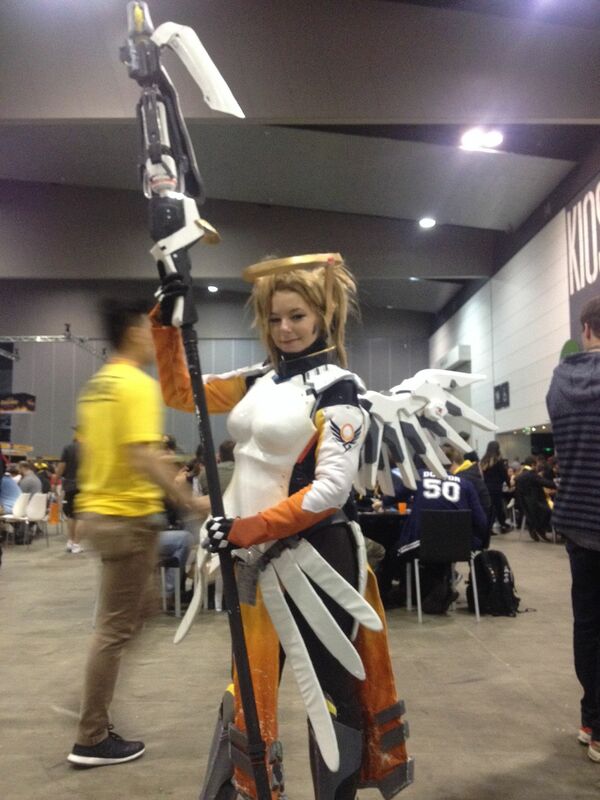 Having never been to a gaming or comic convention, I was equally excited and apprehensive. Tradeshows can be pretty dire, with bored vendors trying to attract your attention while you studiously avoid eye contact. 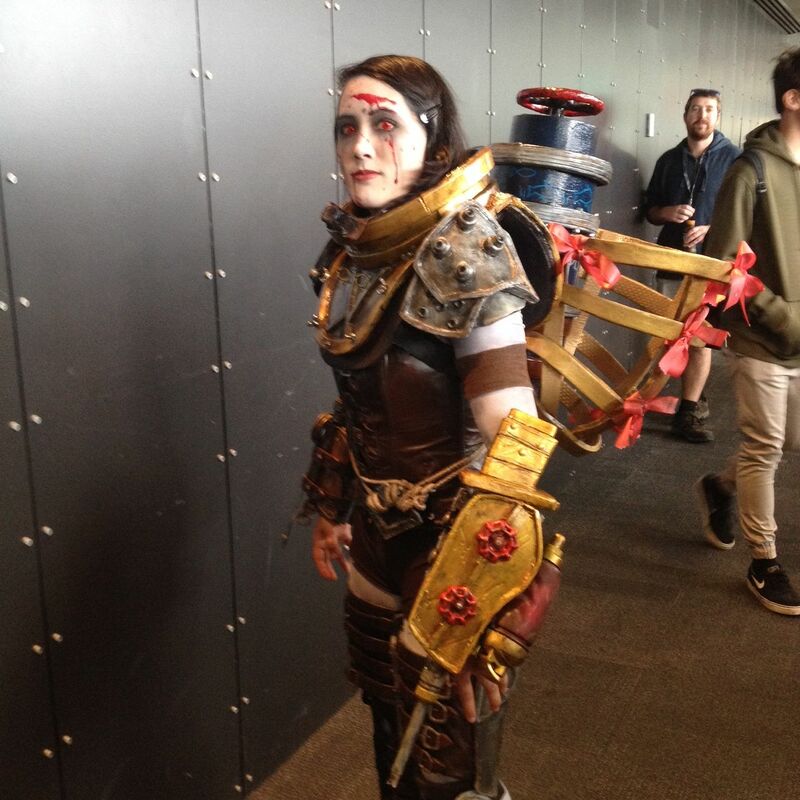 Embarrassingly I’m not sure who she’s playing, but *wow*. Entering the vendor hall surrounded by thousands of fellow fans pretty quickly allayed all remaining fears: this was going to be fun. Massive displays from major industry players, sound and vision overload, hardware to ogle, and all in the name of gaming. The dominant games were easily Overwatch and the venerable CS:GO. Overwatch was everywhere, being used to demo super fast monitors, LED headphones and keyboards, controllers and just about anything else. Most of the vendors had LAN setups which were allegedly to demo their hardware, but really most people were just enjoying the opportunity to play 6v6 in the same ‘room’. On the hardware front, the main thing we noticed was that VR is everywhere, though the queues were so long for all of them that we didn’t get to play any. There’s definitely some momentum around this latest attempt, no doubt seriously boosted by the offical PS4 VR hardware – they had the largest stand and longest queues. 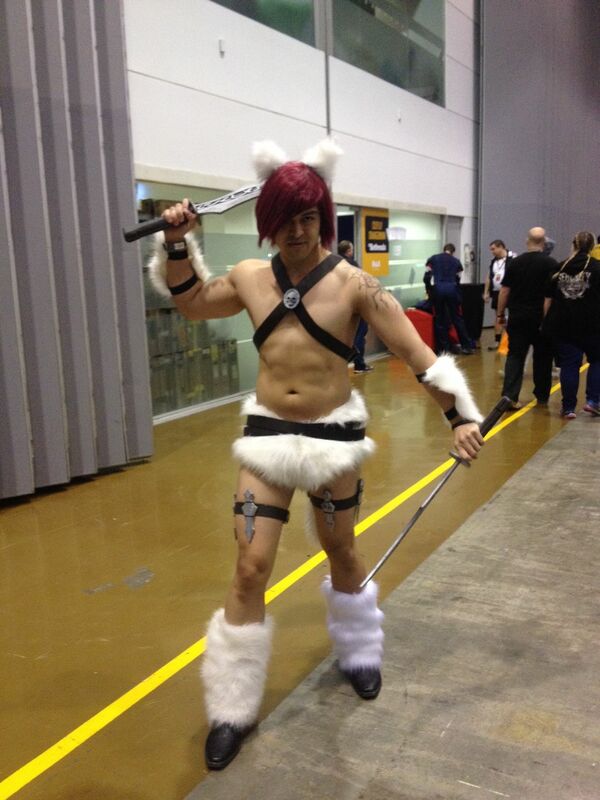 It was also hugely entertaining constantly seeing amazing cosplay everywhere you turned. One moment you might be playing Mei, the next she’d be standing next to you with Reaper and Soldier 76 for good measure. So far so good, but the real highlight came when we emerged from the cacophony of the demo hall into the (relative) serenity of the second main hall, which is effectively a fan-run celebration of gaming in all it’s shapes and colours. Tabletop, RPG, console, PC, retro, pinball, miniatures, dice, you name it. No really, you name it. There are hundreds of tables setup for tabletop gaming, ranging from cards to miniatures to old school boardgame history (you could borrow just about anything from a huge selection of carefully maintained boxes). The amazing thing was that there were volunteers for every game, just sitting waiting for people to plonk down and learn how to play. No sales pitch, no pressure, just a celebration of a game they love and knowledge they want to pass on. A collection of vintage machines were constantly in use (I struggled against R-Type with an very ancient joystick attached to a Commodore-64), as was the console rental area where you could pick any game from a huge library, grab some controllers and play for as long as you like. We entered a PS4 Overwatch comp and were promptly trounced, but it was a great experience complete with an encouraging audience. You could learn to paint figurines, enter pinball comps, collect and trade pins, or choose from any number of Role Playing game sessions, complete with volunteer GMs and newbie-friendly guidance. We played a one hour Adventurer’s League DnD mission which was a hoot. 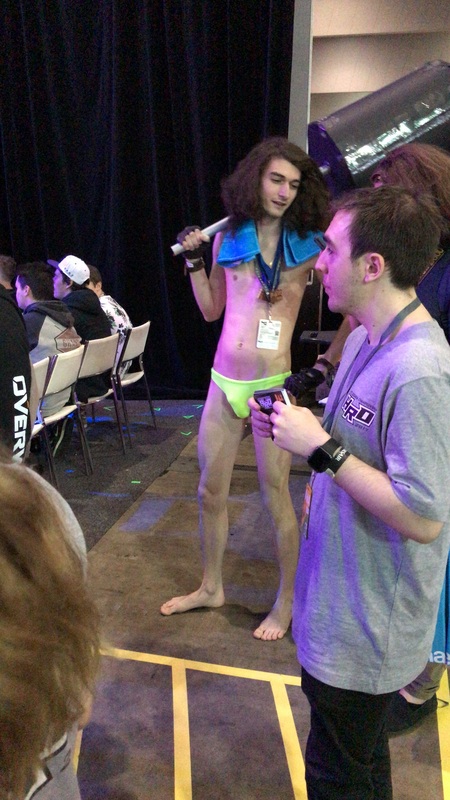 The ‘fan hall’ was the true heart of PAX and no doubt a large reason for it’s continued success and popularity. No matter what kind of gaming you enjoy, there was a way here to enjoy it. My only regret was not getting to see any of the many many talks and panels that were held throughout – Fight of Fandoms: Fallout vs Witcher, SUPER HAPPY FUNTIME TOKYO GAMESHOW HOUR, the Omegathon etc. Obviously a reason to go back next year! 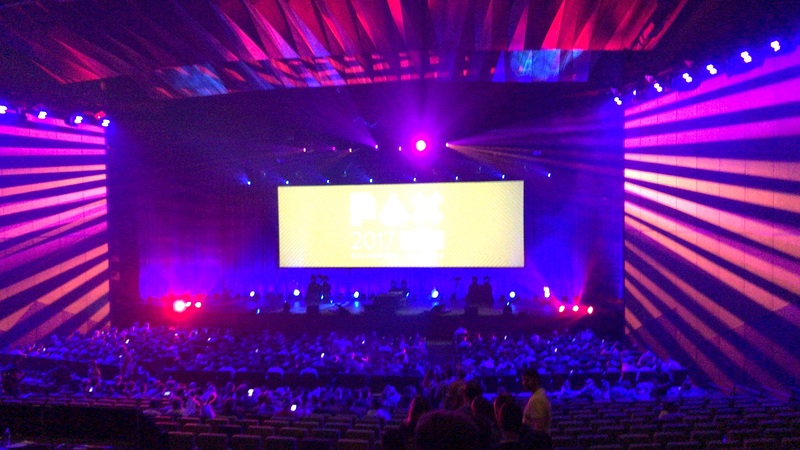 Accordind to Wikipedia, PAX was created by the Penny-Arcade team because they “wanted to attend a show exclusively for gaming”. It would more accurate to say it was created for gamers, and it’s a huge success.